What is Dry Oil, and Should You Be Using It? What is dry oil? Well for starters, it is not dry. Glad we got that out of the way. Dry oil is less greasy, less wet, and lighter than regular oils. Many use dry oils on their skin, and when used on hair they will give it a shine to be envious of. Dry body or hair oil is usually in spray bottle to release a veil of mist that helps the oil-based treatment spread evenly. According to beauty journalist Anna-Marie Solowij, dry oils contain smaller, more easily absorbed molecules that are ethereal and evaporate rather than just leaving a greasy afterglow. The key ingredient that gives dry oils their effortless glint? Cyclomethicone, a clear, odorless silicone that is a base solvent that blends well with fragrance oils. Cyclomethicone leaves the skin and hair feeling soft and silky, and since it is a versatile substance consisting of an unmodified silicone, you get the slip we curlies, coiles, and wavies just adore! They do have other great ingredients like essential oils and carrier oils that are bursting with benefits from their richness in fatty acids. Because there is little to no water you get the pure lipids to penetrate the hair shaft and moisturize the hair. 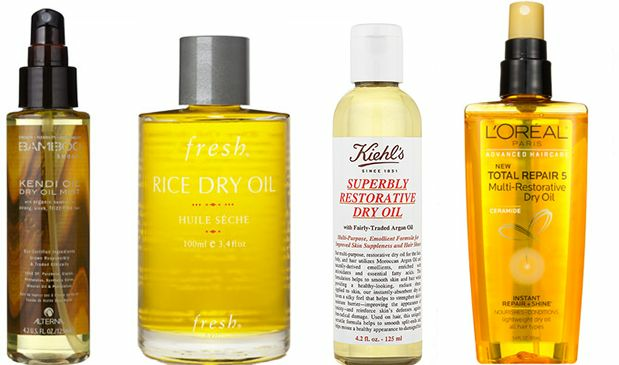 Who benefits from using a dry oil for their hair? Those who want to seal in moisture without greasy residue. This would be ideal for fine-haired or low porosity curlies and wavies. If you do not like silicones this is not the product for you. Expert Deb DePiano, owner of Los Angeles DePiano Skin, says that dry oil dries quickly without oily remains. I was somewhat shocked at just how many dry oils are in the market but do not seem to be getting much attention from the curlies and wavies. Is this a grave oversight on our part? Maybe, or is it just because silicones get such a bad rap in our sector of the hair world that many of us would not even dare to give them a try? Well, most of us perceive silicones to be the big bad hair wolf and many find them perfectly ok in their hair care regimen; it is all a matter of preference. With that being said, I think they are worth a try and here are a few with great reviews and ingredients. Coconut oil, olive oil, and carrot oil are a few ingredients amidst this dry oil formula. This will help to control flyaways and would be ideal to create lightweight sheen for wavies or curlies who are rocking a straightened look. Bamboo extract, fennel seed extract, and saccharomyces lysate extract are in this weightless, nutrient-rich oil mist that is loved my many for protecting hair during heat styling. It will add shine and boost your hair’s health. With double-duty capabilities, you get both a nourishing deep treatment to help seal dry ends against environmental damage or a color protecting style primer. Cyclopentasiloxane (silicone), soybean oil, safflower seed oil, and coconut oil are in this dramatically lightweight dry oil that can be used on your face, body, and hair. It quickly absorbs to smooth and soften and free of parabens, sulfates, mineral oil, and petrolatum. Dicaprylyl ether (an emollient naturally derived coconut and palm kernel oil), apricot kernel oil, squalane (promotes skin elasticity), and caprylic/capric triglyceride (and emollient derived from coconut oil and glycerin) make up this versatile, restorative dry oil that is for your body, face and hair. It rapidly dissolves to correct the appearance and texture of your hair and prevents split ends. Caprylic/capric triglyceride (coconut derived emollient derived from coconut oil and glycerin), shea butter, sweet almond oil, and soybean oil come together to create lightweight hydrating spray. As it revitalizes your senses, it also eliminates dry skin on your body while adding shine to your tresses. A concentrated blend of nourishing natural oils like jojoba oil, borage seed oil, grape seed oil, rice bran oil, and ginseng extract come together to seal in 24-hour moisture in body and hair. It absorbs quickly and makes your hair and skin healthier looking and radiant. Do you use dry oil?